Small is beautiful. 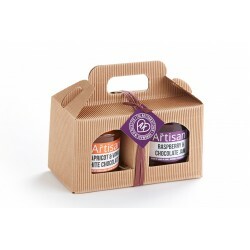 The Artisan Kitchen preserves are handmade and homemade - literally - in small batches in a big copper pot bubbling away at the heart of a small Gloucestershire kitchen. Trained chef Sarah left the world of Michelin starred restaurants behind to dedicate her time to hand-crafting her multiple award-winning preserves. The Artisan Kitchen only use the very best natural ingredients of the highest quality using local fruit wherever possible, and often foraged from the abundant crops in the Gloucestershire countryside. They don't just believe a premium hand-picked crop makes the best produce - they know it. Their jams look, smell and taste sublime. Their awards cupboard is overloaded with their most recent accolades including their Blaisdon Plum Jam being awarded one of the Top 50 British Foods in 2014 and The Artisan Kitchen winning small artisan producer of the year to boot.